There has been unprecedented demand for Iceland jerseys following their amazing performance at Euro 2016. Following their upset of England in the Round of 16, Iceland’s incredible run in the ongoing UEFA Euro 2016 has thrilled the world but also has their football jersey sellers scrambling to meet the unprecedented demand. Iceland are playing in their first major tournament and have made quite an impression, already reaching the quarter-finals. Cristiano Ronaldo bitterly said that they would go on to do nothing in the competition after Portugal couldn’t find a way to beat them, but all that seems to have done is fire the nation to an improbable and yet richly deserved run to the quarters. In truth, Iceland had an immense qualification campaign and their performances shouldn’t be so much of a surprise and yet, the sheer magnificence of their achievements have world football still looking on in wonder. A country with a population of 3,30,000 they’ve made the most of their resources and built a team with resilience, cohesiveness and technical skill, all qualities that were instrumental in knocking out England in the Round of 16. Meanwhile, they’ve been a flood of jersey orders for Sport Company Ehf, Iceland’s official jersey distributor, and Errea, the Italian sportswear company that makes the apparel. 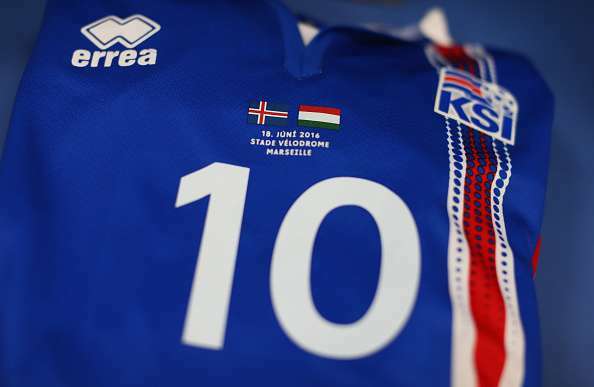 The Sport Company had estimated demand for jerseys to be about 30,000 according to its general manager, Thorvaldur Olafsson but that estimate has been blown out of the water as Iceland have exceeded expectations and delighted neutrals. Erreà, Iceland’s kit makers were founded in Torrile, Italy in 1988 and Iceland are the Parma-based company’s first team to make it through to a European Championship. They are also a significantly smaller firm that the Euro’s other kit makers Nike, Adidas, and Puma. Errea, which has two factories and also had contracts with football minnows Malta, Cyprus and Luxembourg is just about keeping up with demand from retailers because it produces everything in-house. They have a contract with Iceland until 2020 and are hoping the national federation overlooks offers that are bound to come from bigger rivals after the tournament. Errea are working 24/7 with a night shift to meet the heavy demand. The fact that they are a manufacturer as well helps but it’s still said to be havoc there at the moment. Iceland’s success has dominated the talk in the country, with their residents now queuing up to possess their national team jersey. The BBC reported that as many as 30,000 people from Iceland, or 10 percent of its population, missed last week’s presidential election there because they were in France following the national soccer team. An allocation of additional tickets for Iceland fans was sold out in less than three minutes on Tuesday, reflective of the euphoria that has now built up around the team. Iceland take on France on Sunday night at the Stade de France in Saint-Denis and though the hosts are heavily fancied to make the semi-finals, Iceland’s run is reminiscent of Leicester’s unlikely and staggering Barclays Premier League win. Even if they are to crash out, Iceland seem to have won over the neutrals and arrived at the international stage, and the demand for their jerseys will surely eclipse past records. Sport Company has already passed its total revenue for last year and will surely be hoping that Iceland can go one step further in Euro 2016.